Planning the perfect March Madness party is pretty difficult, especially if you want to keep the party going throughout the entire season. The NCAA Party Budget can help you plan everything out and save money game after game. No need to bust out your calculator either, the free template will take every total you enter and give you an accurate account of your expenses. Now you can have your cake and eat it too or maybe some nachos. 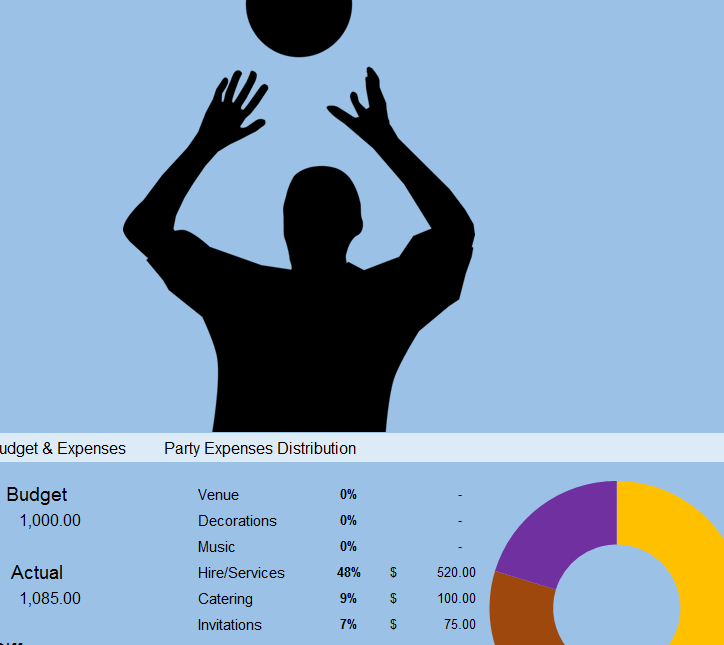 Download this free budget template to get started on planning the perfect party for basketball season. The link to download this free Party Budget is located at the bottom of this page. Next enter your budget in the upper left-hand column of the document. The example budget lists “$1,000” as the budget for this basketball fan. You can change this amount or any other piece of information simply by clicking inside the cell you want to change and typing something new. Now, start entering your expenses in the “Description” section of the document. However, before you enter your items, make sure to set the appropriate currency symbol in the table to the right. Now, go through each category and enter the items and their price and replace any examples that don’t apply along the way. When you have finished entering all your items in the expenses section, you can view a full breakdown of how much each category cost you for your game. You will use this information to apply more of your budget to food or maybe even a better sound system. Use this Party Budget to stay within your budget and have the best NCAA party of your life. Having a good time doesn’t have to cost you an arm and a leg, download this template today to get started.